Tag line:"He was just another movie director...until he found himself a gimmick"
If any filmmaker deserves to be the subject of a documentary, it’s William Castle. As much a showman as he was a storyteller, Castle produced and directed low-budget horror movies, then devised “gimmicks” to get people into the theaters to see them. Spine Tingler! 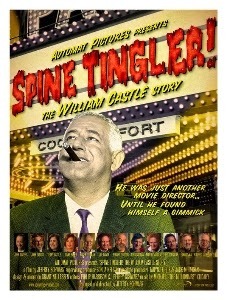 The William Castle Story, a 2007 documentary produced, in part, by Castle’s daughter Terry, covers a few of his incredibly imaginative “campaigns”, while at the same time painting the picture of a man who longed for more respect than he usually received. An orphan by the age of eleven and a high-school dropout, William Castle’s life forever changed when, as a young man, he attended a stage production of Dracula, starring Bela Lugosi. From there, he learned not only how to tell a good story, but sell one as well. After several years working as a hired hand, assisting George Stevens on Penny Serenade and buddying up to Columbia Studios head Harry Cohn, Castle set out on his own, making films such as House on Haunted Hill, The Tingler (both with Vincent Price), and 13 Ghosts, and taking an active part in the promotion of each and every one. And what promotions they were! For House on Haunted Hill, Castle arranged for a glow-in-the-dark skeleton to emerge from the back of the darkened theater and, at a key moment in the film, fly over the audience’s heads. For The Tingler, he went a step further, installing an electric buzzer in the seats and giving viewers an “electric shock” as they watched the movie. He was even bold enough to offer those too frightened to sit through 1961’s Homicidal their money back (seeing as they had to go to an area called “Coward’s Corner” to receive that refund, I’m guessing very few people took him up on it). Then, in 1968, Castle finally hit the big time, producing the meg-hit Rosemary’s Baby. But with the notoriety came a little heartbreak; Castle received hate mail, not to mention the occasional death threat, from Christian groups upset he’d made a picture about the devil. Spine Tingler! is, in many ways, a standard documentary, with archival footage and plenty of interviews featuring those who knew Castle, and the filmmakers he influenced (director John Waters is a particularly vociferous fan). Yet, despite the usual trappings, Spine Tingler! is a fun motion picture, which I’m sure has something to do with its subject matter. Decades after his death, William Castle can still sell a movie!